Obituary for Barbara Lynn Addis-Smith | Campfield Hickman Collier Funeral Home, Inc.
Mrs. Barbara Lynn Addis-Smith (nee Seibert), 82, went home to be with her Lord and her first husband, Charles Wilbur Addis, on Thursday, January 24, 2019.She and Chuck met in high school and were married on January 1, 1955. With a home base of Norton, Ohio, they raised a family of four children, before Chuck’s death in 2003. Life in Melody Village in Norton produced years of wonderful family memories and a nurturing environment. Along with the Norton life came additional, lifelong memories with “Class of 54”, church, and other family friends. All of them were cherished. At Barberton First Church of Christ, she met David Smith, and they were married in 2004. For 14 years, David provided love, partnership, and many memories for Barb.She was a life-long sports fan - all the way from a Hazelwood Cornpopper in grade school to being a Barberton High School cheerleader, graduating in 1954. For Barb, life was all about faith, family and friends - and the sunshine! Barbara was a devoted sun bather and you would never see her without a tan. Her favorite vacation was at a white sand beach anywhere in the world, especially Hawaii. Barb retired from work after 25 years from Roadway Trucking Company, working in several positions. 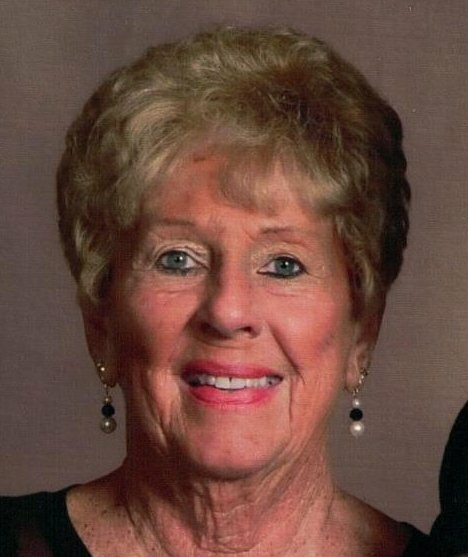 Her favorite avocation was being with her family and singing or playing the organ and piano at First Church of Christ, Barberton First Baptist, and Lakeview Christian. She loved the Gaither band and the Collingworth family music.She was born to Nadine and Leonard Seibert in 1936. She is preceded in death by her mother and father, husband Chuck, and brother, Bobby (sister-in-law Shirley) Seibert. She is survived by brother, Larry (Lynda) Seibert; sons, Charles Craig Addis, Dana (Laura) Addis, Brian (Beth) Addis and daughter, Cindy (Gene) Emerick; stepsons, David Smith and Michael (Betty) Smith; stepdaughters April (Mike) Moore, and Kerri (Jeff) Thomas; grandsons Michael (Leigh), Matthew (Amber), Jared (Ashley) , Justin (Stephanie), Jesse (Megan), Dean, Noah, Hudson, Adam (Elizabeth), Ryan, Tyler and Anthony; granddaughters Kymberly, Isabella, Hannah, Olivia, Sarah and Kacie (Jason); and 8 great grandchildren.Friends may call at First Baptist Church, 254 Sixth St., N.W., Barberton 44203 on Sunday, January 27, 2019 from 3-7 pm. Where her funeral service will he held on Monday, January 28, 2019 at 1 pm., with Pastor Mike Prebynski officiating.Barb’s friends may also call 1 hour prior to service. Burial will follow at Greenlawn Memorial Park.In lieu of flowers donations may be made to First Baptist Church in Barb’s memory or Cleveland Clinic Akron General, Justin T. Rogers Hospice Care Center, 3358 Ridgewood Road, Akron, Ohio 44333.